I spend far too much time on this hobby, but I guess it keeps me from more harmful, dangerous or otherwise deleterious stuff. I spend some time searching, looking at (some of) the online watch magazine sites, but more researching older stuff. This means that I have got reasonable at spotting things, and chasing them down. I don't class myself as lucky but I have found a few interesting bits and bobs in the watch world, I suppose you could call it making your own luck. One thing I spotted recently was the announcment of a watch from Siduna. Who? No, I had no idea either, but this was a picture search, and the thumb looked very intriguing. So a bit more digging found me the Siduna site, and the explanation of the name, a Swiss watch factory that re-located to Denmark way back when. The re-invigorated brand is now based just over the border in Sweden, which also explains their current offer of a modern re-interpretation of the Lemania SwAF (or Viggen, or M3440). One of Sweden's most iconic watches. As a tool-chronograph kind of guy, I am very much in the camp that suggests that the best looking watches ever are somewhere between the Zenith Cairelli, Lemania SwAF (or SAAF), maybe the Breguet Type 20. That type of thing, a good functional, white-hands-on-black-dialled uni-compax (or compax) chronograph with a bezel. You can probably guess why the picture sparked my interest. And I have been searching for a good modern one with good WR that I can wear for most things at a reasonable price for a while. The Siduna announcment was in May, (which I missed at the time) and had since featured on WornandWound but had not seemed to propogate elsewhere to a large degree. I guess there are a lot of new brands competing for space now. I explored their site, which seemed relatively simple, so I fired off an e-mail to the customer service with a few more questions about specification and procurement. A reply quickly came from Francis, the general manager and designer. We got chatting over e-mail about this model and chronographs in general, as we clearly shared this interest and many views on the subject. Before I know it, Francis kindly offered a loan of one of their prototype watches for my consideration. Lucky me. He would send it to me in return for a deposit, and I would return it when I was done, and share my thoughts on it with him, and here. Great. Being able to get this type of hands on comfort with a new (albeit re-launched historic) brand is relatively rare, we are almost always asked to put faith in a website alone. It also meant I might be able to assist with final detail agreement on the design, which is an attractive prospect. I should add that I am not in any way retained, I am a punter like anyone else. So, whilst we continued to converse over e-mail about movements, chronograph options and developments, the prototype was sent off to me here, and I took it away with me on holiday in Italy last week to take some shots with it and a couple of others, and to compose my views on what I was seeing. What I was interested in was the design and feel of the case, given that it has new dimensions compared to the original 817 case, allowing for an automatic movement, the level of finishing, and the appearance of the gloriously simple Speedmaster-esque white on black legibility of the chronograph. I know the 817-cased models fairly extensively. It is a well known case, originally made by EPSA in the compressor family with their distinctive hatched crownin the mid-late 1960s. The case's straight, downturned, tapering lugs with large chamfer ends and chamfers on all the top external intersections is very distinctive. The EPSA case found use with the latter Breguet Type chronograph, the Heuer 7733-powered chronos from the late 60s as well as the 2446 Autavias, the Lemania SwAF and SAAF, and also with others like the Tissot Navigator, Bucherer, Wakmann, Rodania and Selectron (which I am an owner of). I think probably The Tissot one is the most expensive vintage Tissot known, I am awareof examples have changed hands for over US$7k and one on Chrono24 is currently priced at £9k - hahahahaha. There is also an original Viggen there at £17k. All of these models are from the late 60s and early 70s. Helmut Sinn then much later re-engineered the same EPSA case for the 103, EZM1 and a host of other watches from his stable. Many of those also had a similar enlargement from the 817 for auto movements to be installed, and higher degrees of WR to be attained. Of the vintage models, the SwAF and the Rodania are the only original ones to have used a lumed bezel insert, the rest were all just printed aluminium bezels. Enough of the origins of this design, and on to the current prototype. The spec on this new Siduna is as impressive as you can get nowadays from a new workshop. The movement is developed from the 7750, and not just the off-the-shelf 7753, which would retain a full date mechanism under the dial that Francis was keen to have removed. The WR is 100m, the crystal double-domed aspheric sapphire (AR inside only), C3 grade A Luminova on dial, hands and in the bezel. The bezel is 120-click uni-directional (I prefer this, purist pilots may whinge otherwise) and at a 20% premium you can specify a further movement customisation and add flyback for the chrono. And it is warranted for 2 years. Specifications like this are impressive but not unique, and a cost on €1860 looks very attractive, however a 25% tax is added on top for EU residents, making it about par (imho) for a new brand offering this level of work. For instance, the double-domed aspheric sapphire is a feature to be found on more expensive watches, but the edge distortion of this over a single dome is crucial to maintaining the original's aesthetic. Again, purists might prefer an acryllic, but it is a brave man that specifies this in a world that demands scratch resistance. Just like it would be a brave man that choses to make this a manual chrono like the original. I like the modernisation choices made here, but I am aware that not everyone will. The case finishing is excellent, with brushed surfaces over most of the case, but polished chamfers on the lug edges to provide the all-important contrast that looks so much classier than a uniform finish. Much of the brushing is from the case front to back, and this too contrasts with the bezel which is circumferentially brushed. It is 42mm diameter on the bezel, (40mm on the case), and 16.2mm thick, which is unsurprising given the domed sapphire, 100m WR and automatic movement height. It has 20mm lugs and sits very nicely on my 7 1/4" wrist, not surprising given a lug-tip to tip size of 47mm. Pushers and crown are polished, and I like the addition of the EPSA-derived cross-hatching to the crown. The polished/brushed contrasts are lovely. The bezel action is very nice and smoothly positiive, with just a hint of slack if you rotate it in reverse. Only my Pelagos has a better bezel action than this. The grip on the bezel is relatively thin, but positive, and shares the Lemania SwAF texture, as well as the trick of extending the front facet of the lugs up and over the rear of the bezel. As the bezel is a full 2mm larger in diameter than the case, it is very easy to grip and operate. The dial looks great, with beautifully crisp print and nice recessed and concentrically textured sub-dials, as you would expect. The sub-dial design remains exactly as per the Viggen, but the main dial numerals are slightly altered, with the slightest of nibbles on the 4, 8 and 10 (which the SwAF lacked) and it omits the 3 and 9, which were almost completely nibbled away on the original. The lumed numerals are strangely square profiled, looking like they have been applied out of machined lume, rather than printed onto the surface. The hands are perfectly proportioned for a re-issue, and the lume is commendably bright, especially given that the vintage proportions do not leave a massive area of lume on the hand centres. The 12 index on the bezel and all of the numeration is luminous, and perhaps my biggest issue with the prototype is the mixture of lume and binder. They look great, in terms of design, but I gather the case manufacturer offered this mix, and the binder is specifically waterproof and UV resistant, but it differs a lot from the dial that uses the same C3 compound. The bezel is luminous, and bright, but in normal daylight it looks dull and metallic, and in dimmer light (not bright enough for the lume to shine) it dims down considerably. I would have hoped to see this look brighter in normal light, and equal in colour to the dial when shining luminous in the dark. As it stands it appears dimmer and greener. I am aware that a dial sample has been sent back to the bezel supplier for matching, so this detail will change, I am sure. The prototype came on a very nicely finished padded leather strap (dark brown) with signed buckle, and packed into an elegantly flat box, in order not to pre-shape the strap. It is a compelling little package, even if the box springs are a little snappy to feel really luxurious. I took the strap straight off, as I too wanted to try the watch on, and I didn't want to bend and shape the strap it was sent with, so all my photos are on a nice Pavstraps leather. I can assure you it also looks great on a Nato, as it should, be it black, grey or leather. So as an overall package, this re-imagining of a Swiss/Swedish Military classic is very successful, and I wish Francis every luck in his venture. I am sending the prototype back with gratitude, but the deposit stays where it is. I love the look of a decent domed crystal without oily AR all over it, and with white on black legibility like this, a few reflections do not disguise the time. Thanks Dave, that Siduna really looks great. The only thing which is a bit strange for me is the relatively high (?) 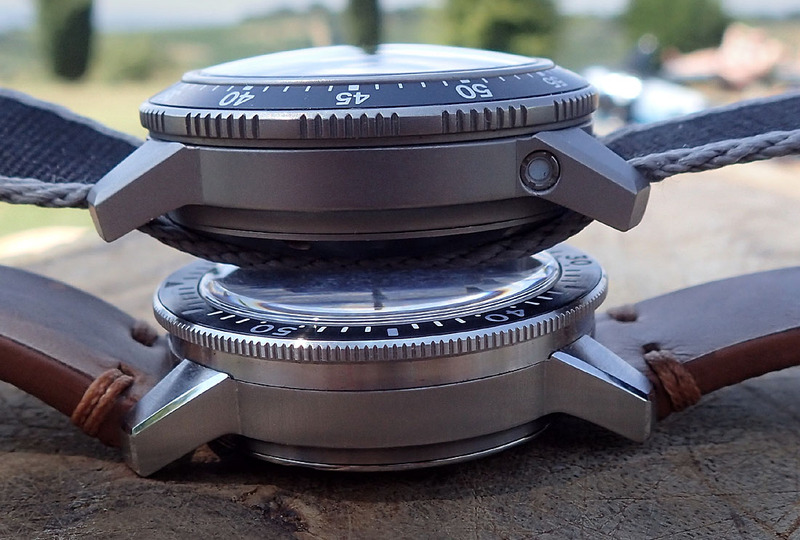 bezel - when viewed from the side as in your stack with the EZM1. If i'd buy a new chrono in that price range this one would be on my list. Btw, i saw the 'new' Heuer Autavia in a shop window in Denmark during holidays, and it looked 'cheap' to my mind.